While most vehicles we cover on this here site are usually purchased by end users, sometimes a few fleet vehicles slip through the cracks. And that’s exactly the case here. 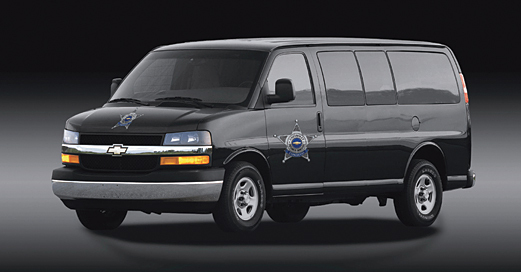 Behold the Chevrolet Express Prisoner Transport Vehicle. As the name implies, the ominous-looking van is designed for “prisoner transport duty as well as general utility” and is available in a 3500 (1-ton) extended wheelbase model that includes standard seating for up to 12 and optional seating for up to 15 prisoners. Remote vehicle starter system, includes Remote Keyless Entry and two transmitters that have a remote panic button. If you’re interested, have a look at GM’s official brochure for the fleet-only Express Prisoner Transport.